To achieve the right balance of nutrients pet food manufacturers blend mixtures of ingredients including meat and fish, vegetables, cereals, vitamins and minerals to produce foods that will satisfy the nutritional requirements of your pet. Pet owners who feed a complete commercial pet food can have confidence they are addressing their pet’s nutritional needs. You can also read more in our Fact Sheets section. Over the decades pet food manufacturers have developed the nutritional expertise to ensure they incorporate the latest advances in pet nutrition. 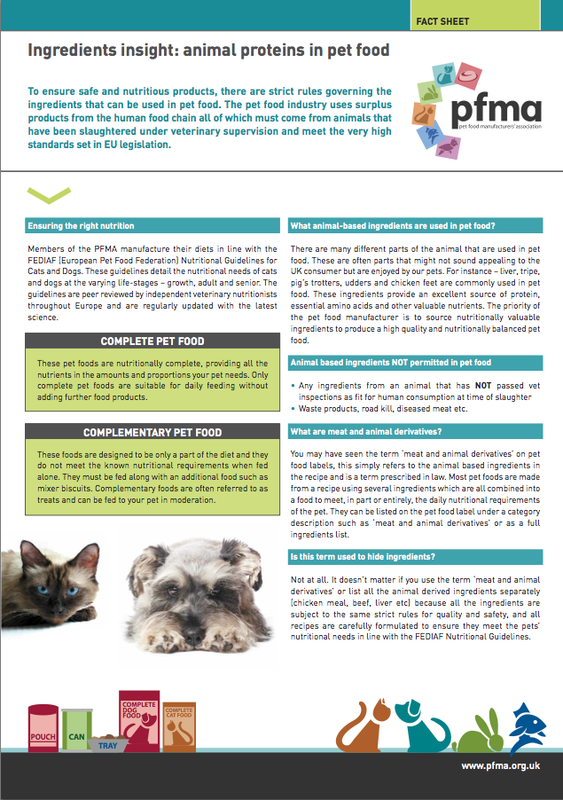 Pet food manufacturers produce products in line with the FEDIAF (European Pet Food Industry Federation) Nutrition Guidelines. These guidelines are regularly reviewed by independent nutrition experts throughout Europe and the United States. There is also strict legislation governing what ingredients can be used in the manufacture of pet food. This legislation is laid down by Europe and also applies to imported commercially prepared pet foods. PFMA members use by-products of the human food industry that come from animals slaughtered under veterinary supervision. These materials meet the very high safety and quality criteria laid down by regulations. Members only use materials from species which are generally accepted in the human food chain. The members use materials of beef, lamb, poultry, pork, fish, rabbit and game. The term "various sugars" is a category description which may refer to sucrose (cane sugar, commonly known as table sugar), fructose and glucose, all of which are natural products present in fruit, vegetables and cereals. Additives which can be used in pet foods include vitamins, flavours, preservatives, antioxidants and colours. Most of the additives used in pet food are also used in our foods. PFMA members only use legally permitted additives and only in the smallest amounts possible. Antioxidants: Dietary antioxidants play a substantial role in the long term health and well being of cats. Some manufacturers may add biological antioxidants e.g. vitamins C & E and selenium, to pet foods to help support good health and neutralise free radicals.